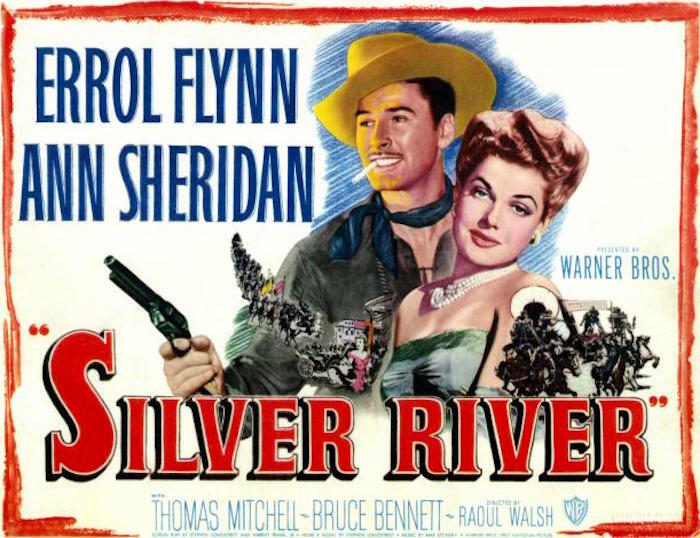 Pre-50s Westerns DVD News #235: Silver River (1948). | 50 Westerns From The 50s. « Four Shopping Days Left Till Christmas. Yes, for anyone who hasn’t seen it, this is a pretty good one. Flynn’s westerns are variable I reckon They Died With Their Boots On and Rocky Mountain are top of the heap but Silver River, with a mature performance by the star and interesting writing is up there too. “SILVER RIVER” seems to have had a bad rap through the decades, main reason is that it has never been generally available to view at all, prior to it’s DVD release awhile back, excepting on old TV stations of yesteryear. TCM ran it once in awhile before the DVD release. The film had minor spots of sound damage on the negative, the reason for it’s neglect. I’ve always cheered on my belief that this is one of Errol Flynn’s BEST pictures, and one of his BEST character portraits –that of a darker shade than usual. And a solid script, a beautiful cast, and Raoul Walsh directing! I only fault this film for one simple thing: TECHNICOLOR was missing–and this picture SCREAMED for it!! Despite a minute of sound problems, (they did not fix the problem!!) this is a picture belonging to any FLYNN or Classic Western COLLECTION, for sure.